The Norwegian Maritime Museum is holding a 1956 drawing by Jan H. Linge for a 5.5mR boat called "Pathfinder". It is not known if this was a proposal for Herman Whiton. The drawing can be purchased for private use. 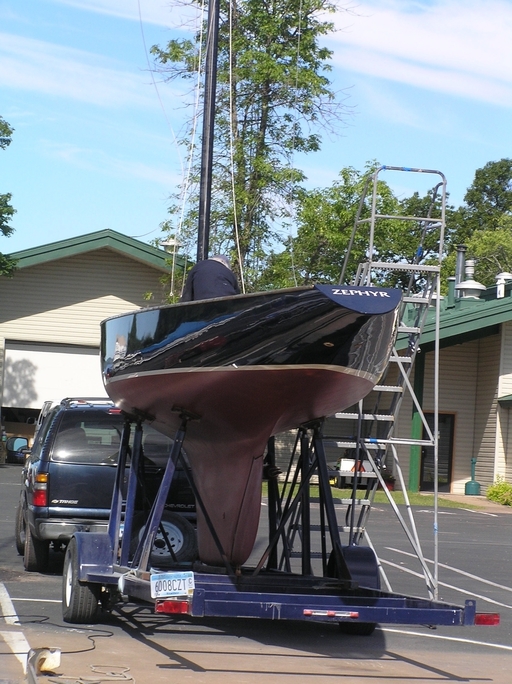 New owner on or about 29OCT2014 is Bob Bruce located in Duluth,MN. Name of boat will be changed from Stars. "...Herman Whiton designed one for himself called the "Pathfinder" which we built for him..."
The complete text can be seen in the notes for US-6. I have a copy of the August 13, 1956 Sports Illustrated magazine that shows a picture of Pathfinder and another 5.5 in the background owned by Edward DuPont. The article cover the Olymipics and one additional photo of Complex II. The builder was Luders Marine Construction Company, Stamford, Connecticut, USA. Look at the photo on the right!